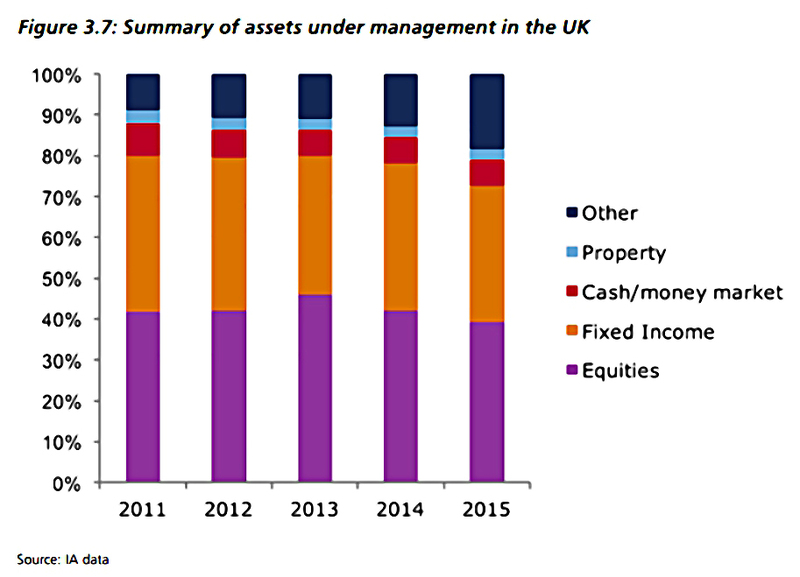 Today’s post is about the recently-published FCA interim report on the Asset Management Industry. After reading the report, the question that comes to mind is the age-old one: Where Are The Customers Yachts ? 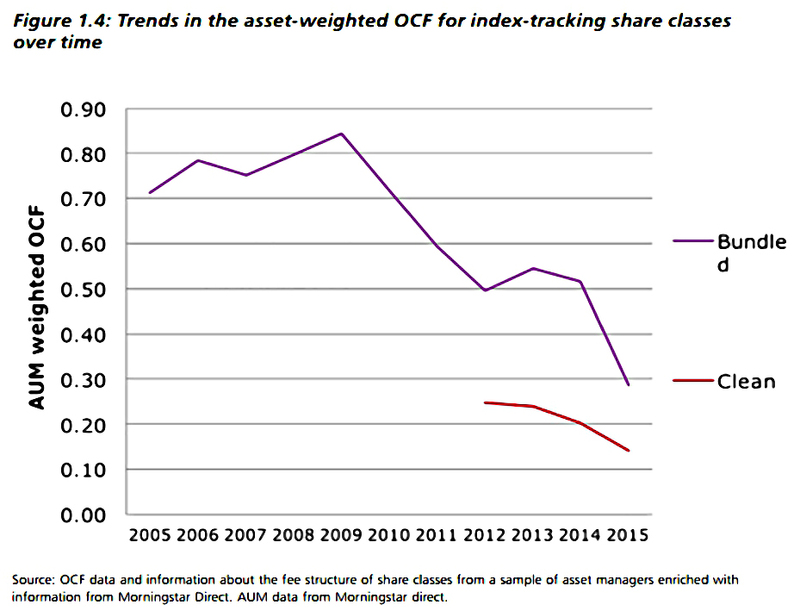 The FCA’s asset management study was launched in November 2015 with the aim of assessing whether competition in the industry was working effectively. It examined whether both institutional and retail investors were getting value for money (VFM). We’ll obviously focus on the latter, but we’ll cover a few of the institutional highlights. If you want some bedtime reading, the complete (208-page) report can be found here. Don’t worry, we’ll mostly be concentrating on the pictures. 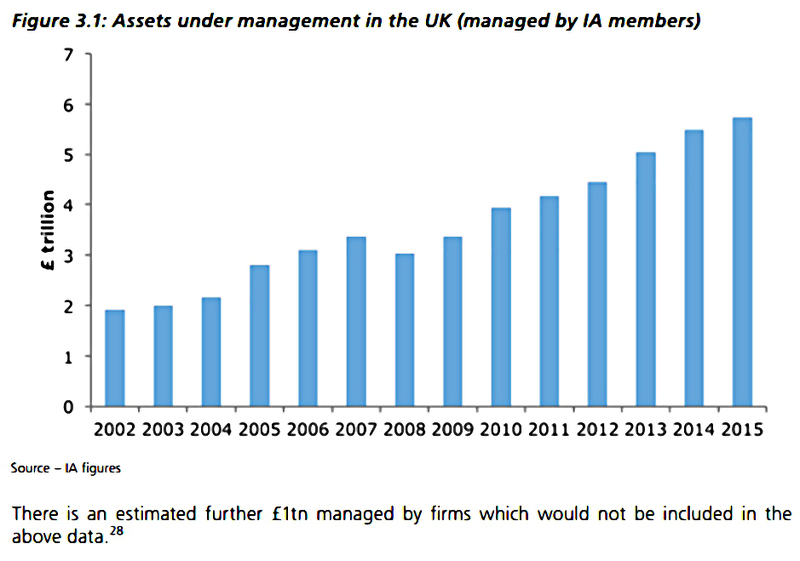 The UK industry is the second-largest in the world, with 1,840 firms managing almost £7 trn of assets. Of this, more than £1 trn belongs to retail (private) investors, and £3 trn belongs to UK pension funds and other institutional investors. The remaining £2.7 trn belongs to overseas investors (private and institutional). Of course, the end-beneficiaries of many institutional investments are individual (retail) investors. More than 75% of UK households are customers of the industry, primarily through personal and workplace pensions. This includes 9M people with DC pensions and 1.2M people with DB pensions. There are also 11M people with stocks and shares ISAs. There are a large number of firms in the industry, yet they have mostly enjoyed high profits over a number of years. 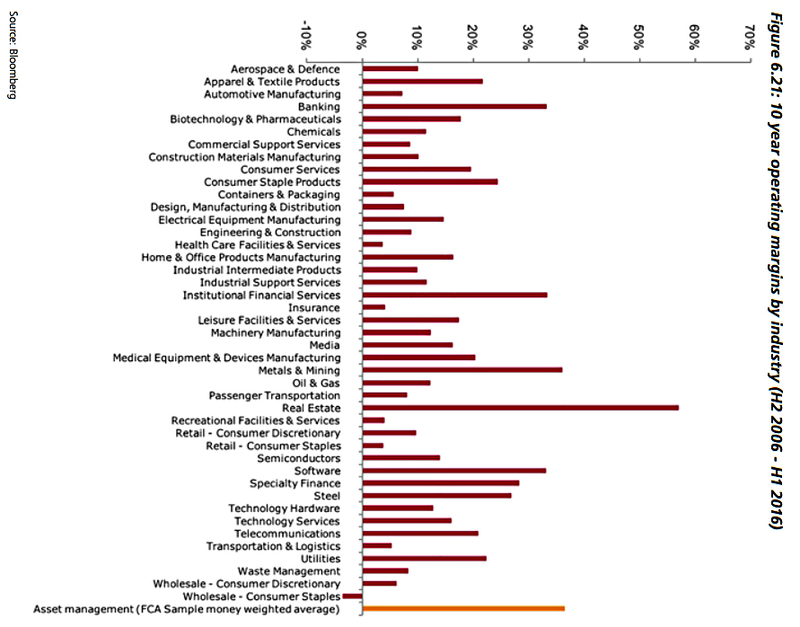 The top 10 firms have only 47% of the market, so competition should be intense. Yet the key finding of the report is that charges (and hence profits) in the industry are too high. Charges matter because they massively impact long-term returns to the investor. 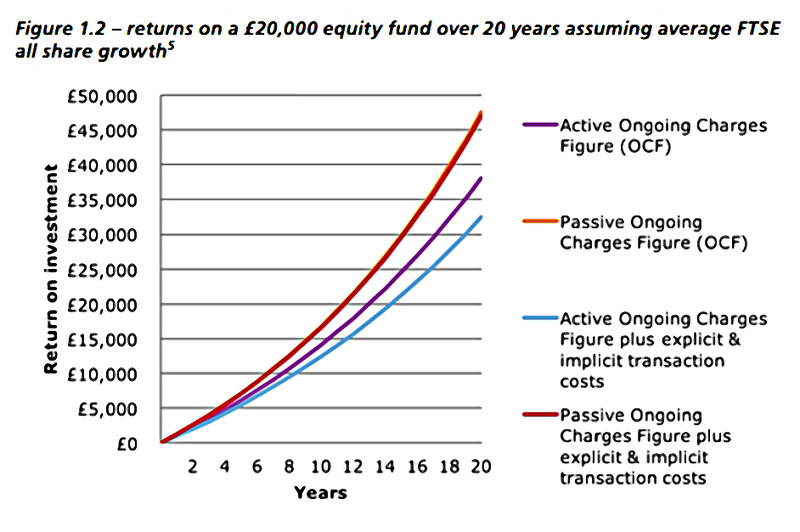 Charges for active funds will take a third of an investor’s returns over 20 years. 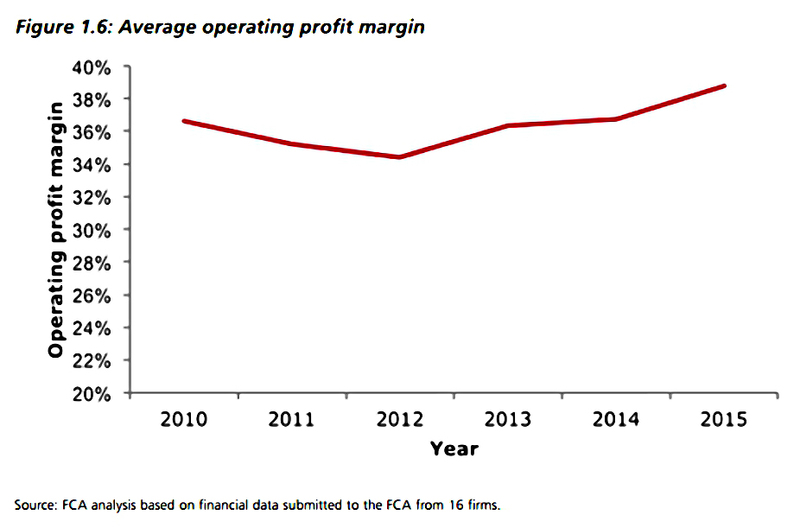 Operating margins have averaged 34% to 39% in recent years – amongst the highest of any industry. Real estate is higher, but the average FTSE All Share firm makes 16%. Another key finding was that scale economies for the largest funds and asset managers are not passed on to investors as lower fees. 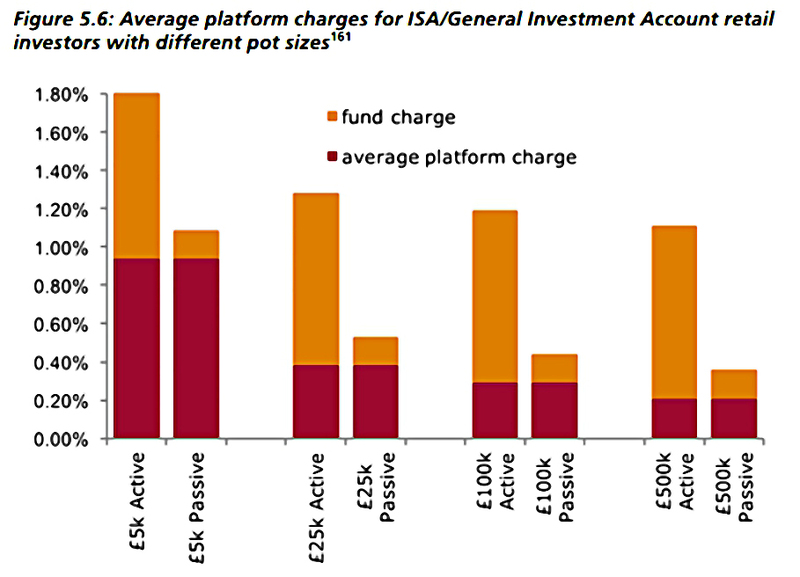 The report also compares active funds to passive ones, and almost comes out in favour of passive funds. 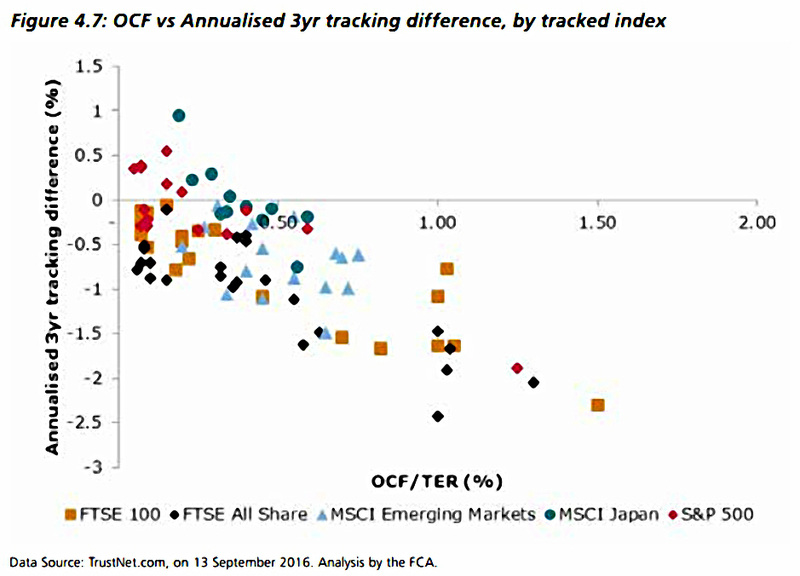 The FCA found little price competition amongst actively managed funds, with significant price clustering. 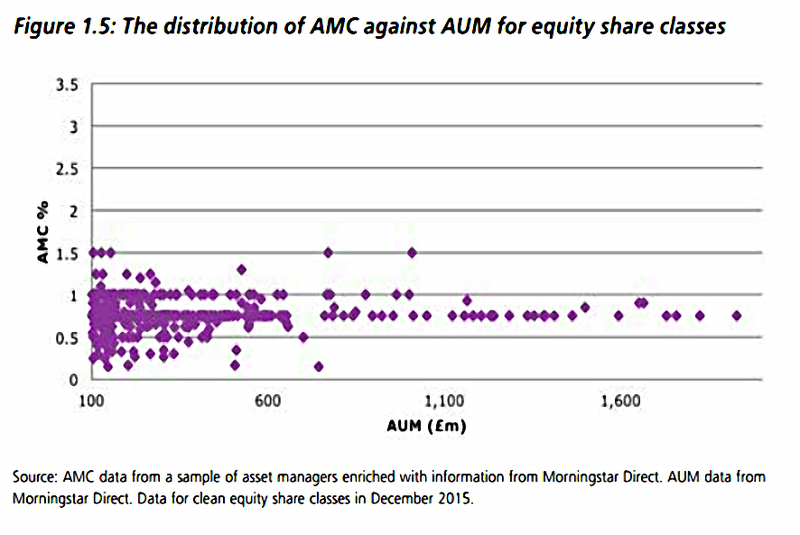 There was more competition between passively managed funds, though there were still examples of poor VFM here. We are not saying passive management is better than active. Perhaps not in theory, but in practice for retail investors in the UK, you aren’t getting anything for the extra costs of active investment (via funds). Reasonably convincing, yet here in the UK, the active / passive split remains around 80:20. In the US it’s closing in on 50:50. Comparing fee levels, fees in the active sector have barely moved in the past 10 years. They still average 0.9% pa.
On the other hand, Passive fees have come down – by more than 50% since 2010. They now average 0.15% pa. Yet they make up only 7% of funds on advisers’ “best-buy” lists. The basic issue is that asset managers don’t compete on price. They told the FCA that they didn’t think that this would win them more business. Instead they highlight past performance. Which as we all know “is not a guide to future returns”. It’s also easy to manipulate – launch enough funds and some will be winners. The bad ones can be closed or merged. Almost 50% of the funds available ten years ago are no longer around. Charges, past performance, likely future returns1 and the reputation of the asset manager came out on top. 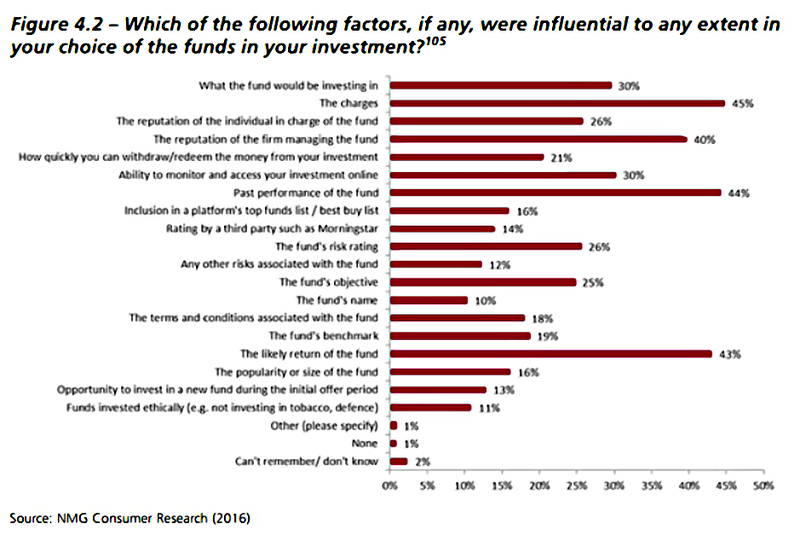 Yet more that half of retail investors were not sure that they were paying fund charges at all. When you’re out of your depth, it can be comforting to buy a product that is “reassuringly expensive”. Something that costs more has got to be better, right? Sadly that isn’t how it works in investment (and often not in wine, either). 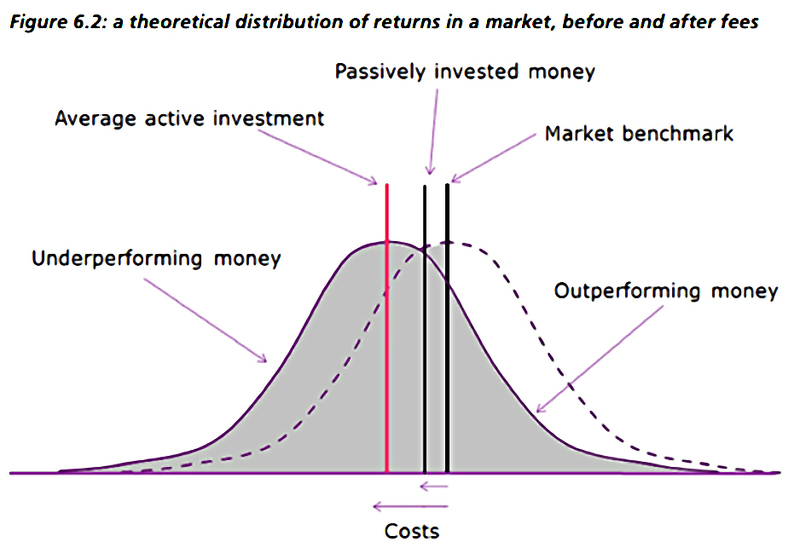 The most expensive funds don’t perform better, as we saw when we compared passive and active funds. 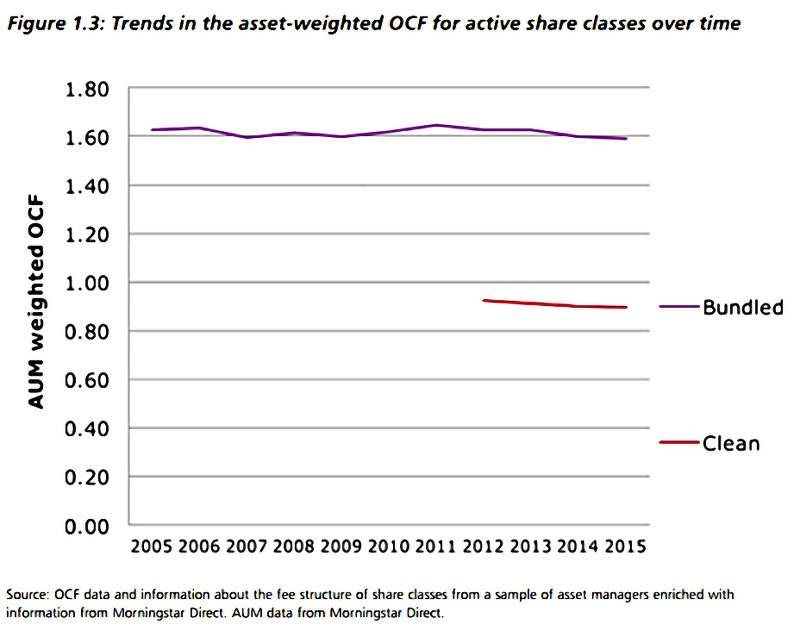 Managers did outperform benchmarks on average, but this outperformance was eliminated by fees. And there was no consistency amongst the outperformers. Only a quarter of the best quartile of funds from 2006-10 remained in the top quartile for 2011-15. This is exactly what the maths of chance would predict. More than a third of the early winners were closed, merged or fell to the bottom quartile. 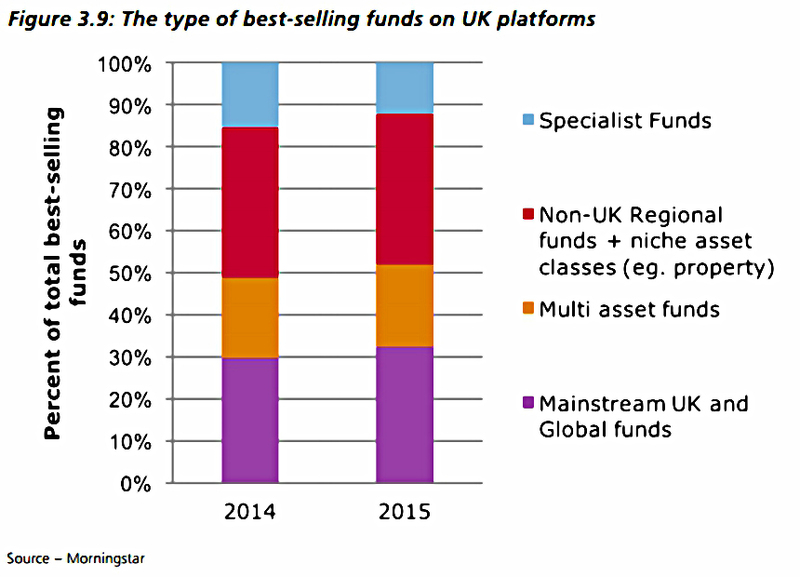 The report also looked at the popular investment platforms in the UK. Hargreaves Lansdown dominates this space. The most useful section of the report looked at charges on platforms. AJ Bell YouInvest comes out cheapest for a “mid-risk £50K portfolio”. 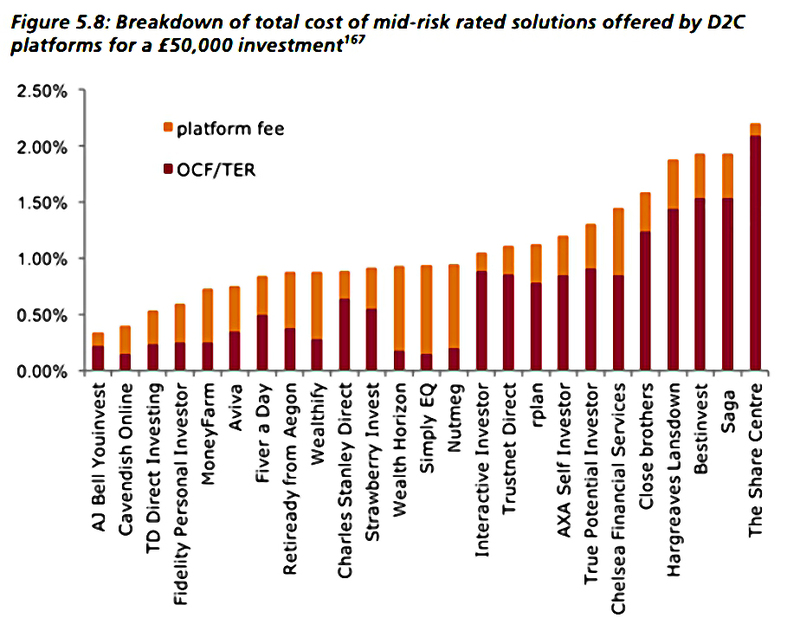 Fidelity does pretty well, but Hargreaves Lansdown is one of the most expensive platforms. 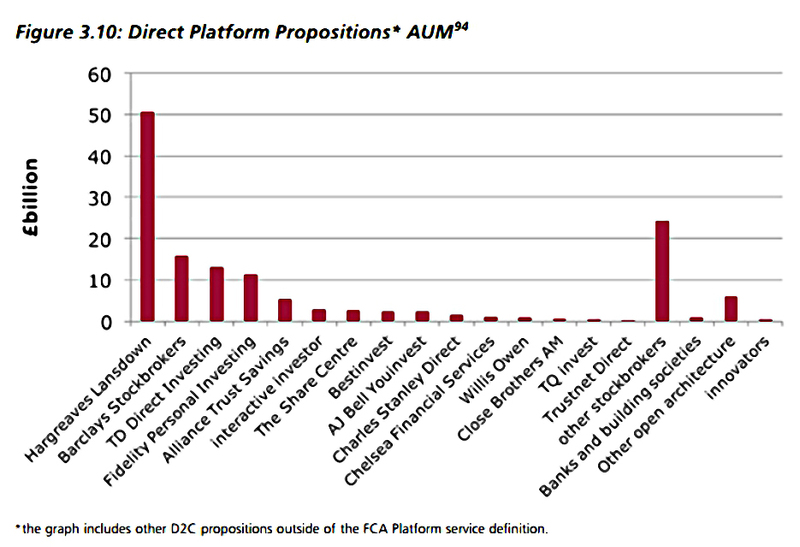 The FCA noted that platforms don’t put downward pressure on prices (eg. by pooling assets). In the institutional space, one of the big issues was the investment consultant business (effectively due diligence for pension funds). The FCA found conflicts of interest that “require further investigation”. There is a strong culture of gifts and hospitality which could influence the ratings given to managers. Consultant-recommended products do not perform better than non-recommended products. 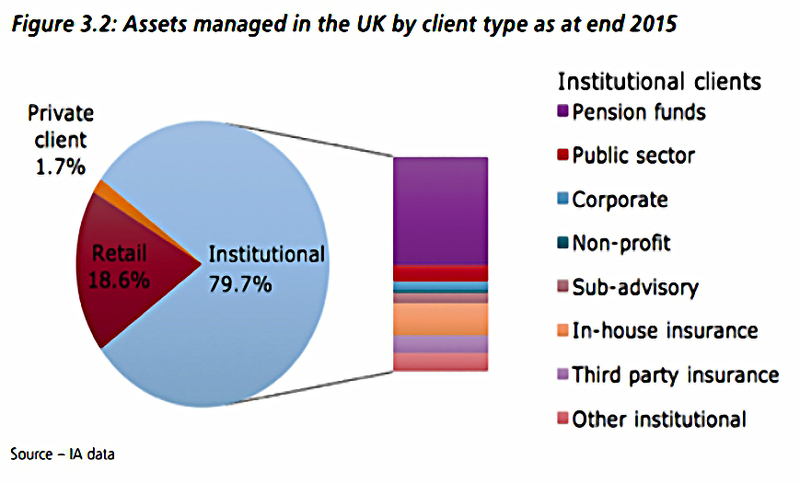 Three firms (Aon Hewitt, Mercer and Wallis Towers Watson) have a 60% market share. Hourly consultant fees encourage a focus on complex strategies that need more research and monitoring. The increasing trend of consultants offering fiduciary management (outsourced-CIO) services means consultants are incentivised to offer their own products. Consultants put too little weight on manager fees and fail to identify managers that offer better returns. Larger (institutional) investors can negotiate these fees down. Consultants appear to be more concerned with making sure that fees are “in line with the market” than in driving fees down”. 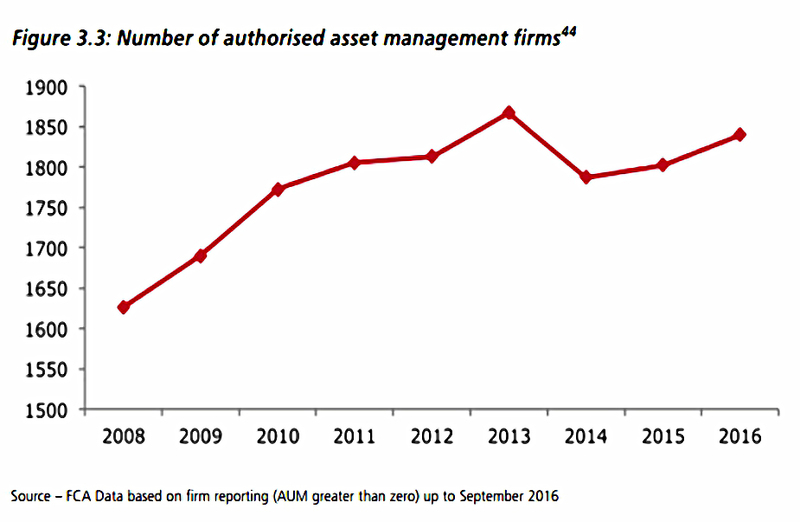 Managers are expected to have a three-year track record, which is a barrier to entry for new asset managers. 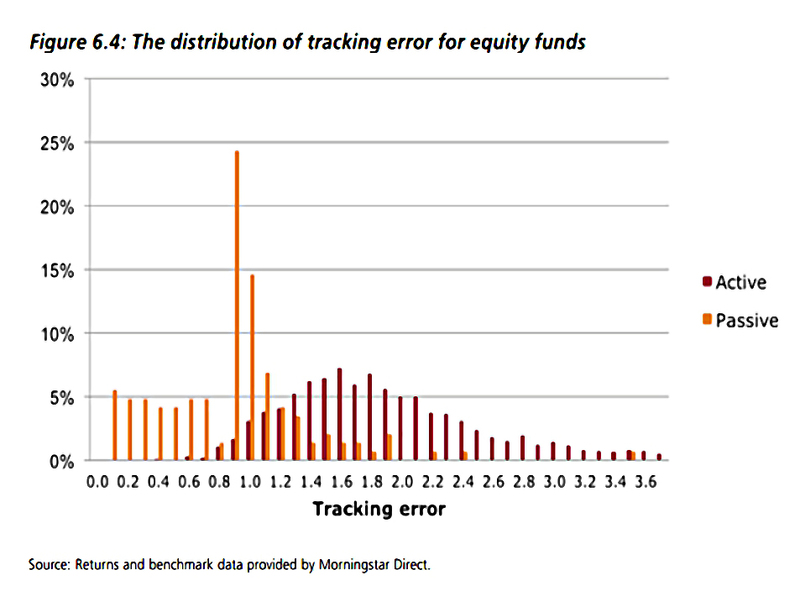 A lot of funds are really just index trackers, and so have no right to charge high fees. 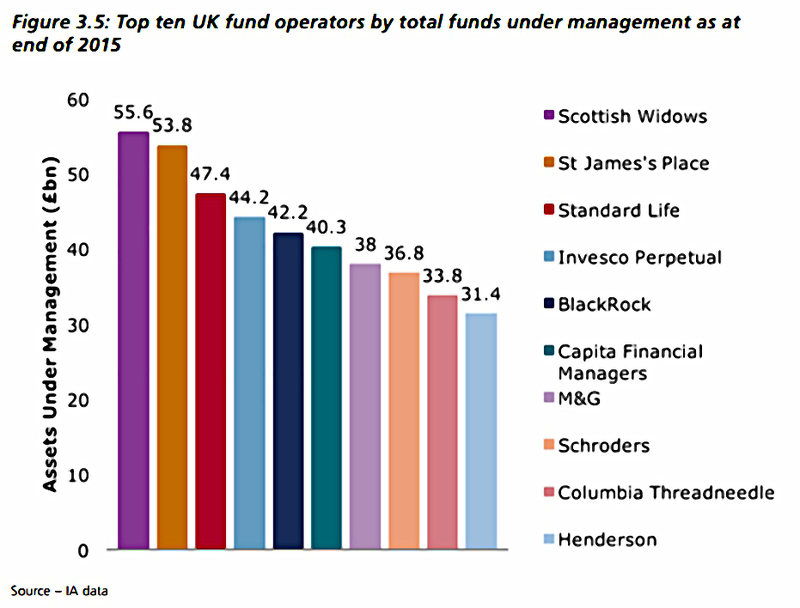 The FCA found that £109 bn was invested in these “partially active” funds. Interestingly, the FCA specifically rejected the term “closet trackers”. The FCA also found that some charges – like transaction costs – were being estimated in advance, or not being disclosed to investors at all. There was also a concern that “box profits” (trading off intra-day buys and sells to avoid transaction costs) were being pocketed by asset managers. The objectives of funds were not always made clear to investors, and performance was not always measured against an appropriate benchmark. The FCA found that high ratings didn’t really predict outperformance, and that certain investment strategies appear to be given more prominence than others. They noted however that changes in popular ratings (such as the Morningstar Star ratings) lead to significant amounts of money being invested in funds. 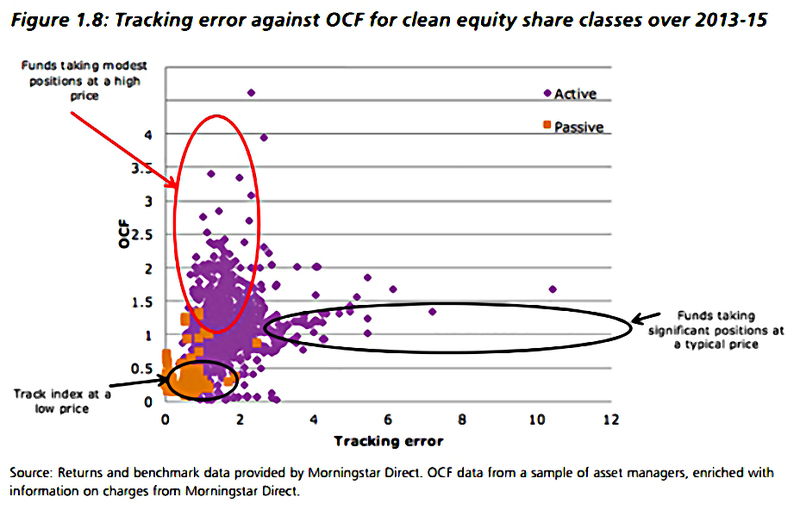 Similarly, appearing on a platform’s “favourite funds” list was not a predictor of outperformance. The main recommendation from the FCA was to make charging clearer through the use of a single “all-in” fee. The current ongoing charges figure (OCF) becomes the actual charge taken from the fund. The OCF becomes the actual charge, however the fund manager will estimate transaction costs. There will be a single charge with no overspend option, so the asset manager would have to fund any difference between the forecast and actual trading costs. There is a single charge which includes all charges taken from the fund, with no overspend option. I think all except number 2 would be a big improvement on what we have now. 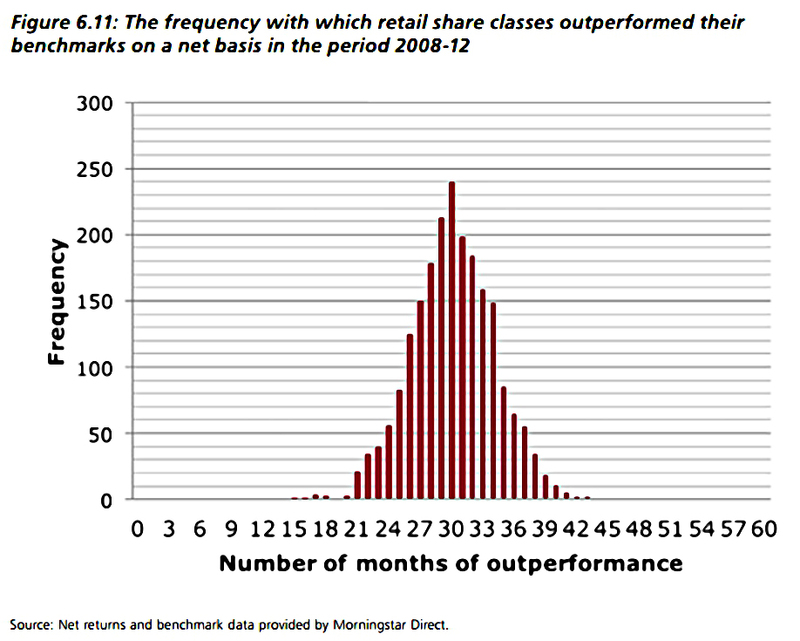 Providing tools to retail investors to allow them to identify persistent underperformance. I think there’s lots of scope for cost savings here. These fairly lukewarm suggestions have been put out to a consultation, which will end in February 2017. The final report and remedies will be published next year. For such a big report, the recommendations are pretty disappointing. I can’t see why the FCA couldn’t be clear that active investing (through funds) isn’t working for UK investors, and that closet indexing is a big part of the problem. 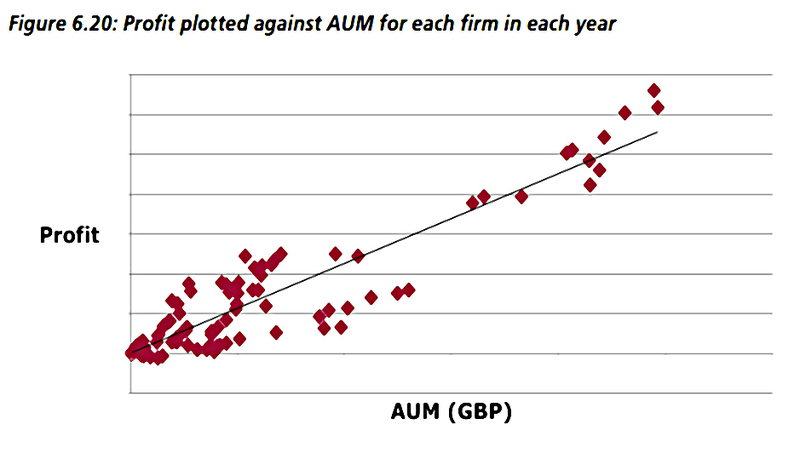 If asset managers compete on track record, that must be because it works. Which in turn suggests that financial education investors would be the proper way to fix things. That would probably be expensive, and it might take a generation for the benefits to trickle through to the market place. So perhaps a price cap would be a better short-term fix. Low base fees for active funds (definitely less than 0.4% and ideally the same as comparable index trackers), plus a performance fee for out-performing a suitable benchmark. 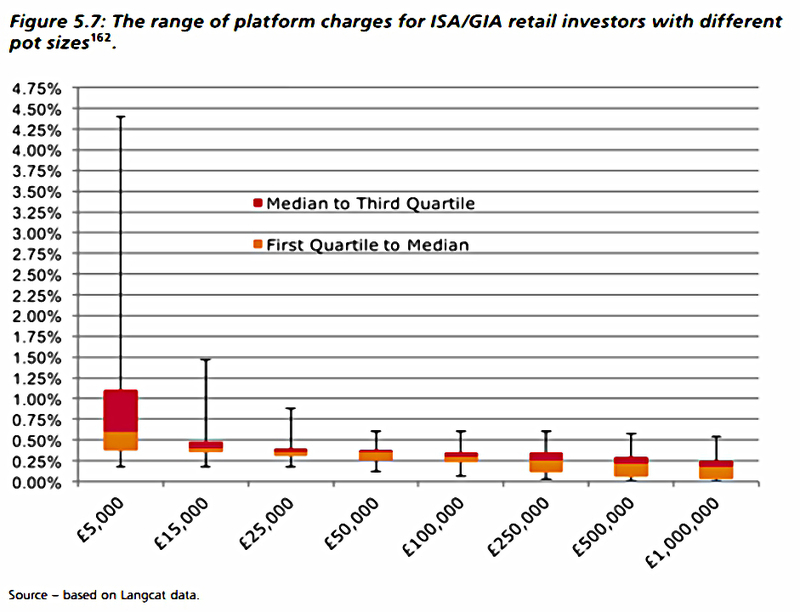 Similar payment schemes for fund rating agencies. Lighter regulation for new entrants to the financial advice market, perhaps subject to a limit of assets that they could advise on (less than £1M per client, say). Completely outlawing trail commission to advisers. Let’s see if any of those make it into the final report. Let me have any suggestions of your own in the comments below.